August 17th, 2018 | Category: Baseball,nba,nfl,Ronald Acuña Jr. In a follow up to the report of Marlins pitcher Jose Ureña throwing a fastball and intentionally hitting Ronald Acuña Jr (ending his streak of homering in five straight games), Ureña has been fined an undisclosed amount of money and suspended for six games. 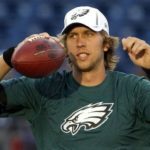 In preseason action, the Philadelphia Eagles QB Nick Foles, last year’s Super Bowl MVP, hurt his shoulder in a preseason game agains the New England Patriots. No word yet on how serious the injury is, and whether he’ll be ready for the regular season. Tom Brady’s preseason debut went much better throwing for 172 yards, two touchdowns and no interceptions in the first half.